Don’t do this. I didn’t have the heart to remove it but was scared to death someone was going to sue me over thorn attacks. 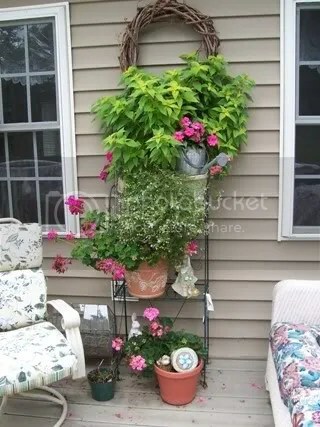 I get hair brained ideas sometimes and figured I would attach it to a trellis somehow grow it up over the top of the porch. The canes would not cooperate at all and this is what resulted. I knew it had thorns but it wasn’t suppose to get so close to the bannister either. These are Don Juan Climbing Roses and just beautiful but the thorns are brutal. I planted them both at the same time and they grew at equal rates. 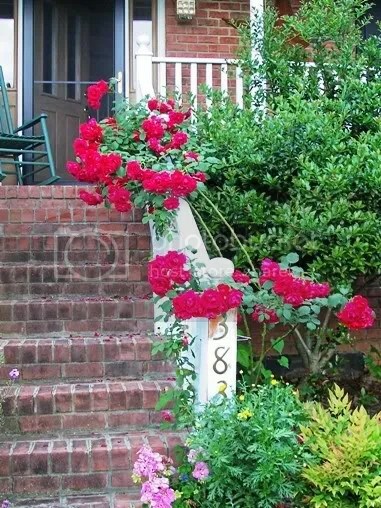 These pictures were taken at my former home and I will not be planting a Don Juan at my new home. I just didn’t like it when it wasn’t blooming. It had few leaves and the thorns looked uninviting. I would plant it along a split rail fence if I ever purchased one. Now that would be a beauty. What could possibly be wrong with this you ask? This! This is a full time watering job! These super plants by Proven Winners are incredible bloomers. They require fertilizing weekly with a weak water soluble mix to keep them looking this good. You’ll be watering regular 2 to 3 times a day in the heat of summer. Flush the pots with lots of water to remove built up fertilizer salts about once a month. Let the water run for awhile and that will do the trick. Extra salts cause the root cells to collapse. I will still grow these wonderful ladies but there will be more dirt in the container and maybe less plants. It would probably be more successful to have these on a drip system. They do better with a slow drip than a watering all at once. I had some success last year with a 2 liter coke bottle inserted so that a slow drip was created. I stuck a very small pin hole in the top and one in the cap at the bottom. It would use all that water in one day and then I’d refill in the morning. Additional watering was required but at least it never dried out. 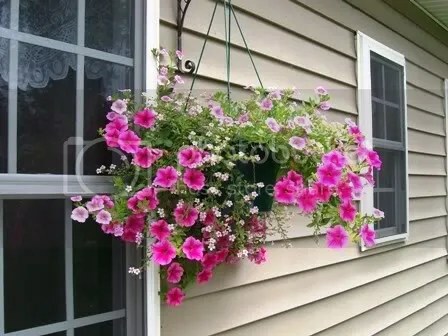 Drying out a hanging basket is the number one reason that the baskets never reach maturity. The one above was babied all summer. I didn’t have to deadhead because Proven Winner petunias are cultivated that way. Don’t let these super plants get thirsty. This is pretty I know but look at that Pineapple Sage in the top container. Was I nuts? I grew another Pineapple sage this year in my vegetable garden and it was about 4×4 feet tall. I did transplant this to my garden and it didn’t like it. It did not like the roots being upset. I found out also that it likes a moist well drained spot just like I provided for it this year. I use to look out my kitchen window at this poor little root bound victim and then go give it a drink…..about 4 times a day. These are all live and learn experiences. You get a bit better every year. One reason I like reading garden blogs is their communication about mistakes. New gardeners need to know that we still make them. You also need to know that I’m going to continue to make them because I like to experiment and push the limits of what a plant can or can not do. But always and I do mean always, your soil must be tip top and amended properly or you won’t be able to experiment at all. You’ll forever fight those growing conditions unless you just learn to amend properly. I am nuts about the tall verbena called Garden Verbena. It grows on a tall stem and adds lots of character to the cottage garden. It’s on my must have list this year and it will reseed. In fact you’ll be picking it out so it doesn’t take over. But I think the good far outweighs the work. roses just need to learn to cooperate. I have some that are also supposed to stay on a trellis and not be a potential hazard to those walking the path to the greenhouse at the school. I enjoyed being at your site last night or this morning as most of my every day readers know that I don’t sleep sometimes. I’m too interested in things….plants mostly. I’m researching spring bulbs at the moment trying to decide if I want some. 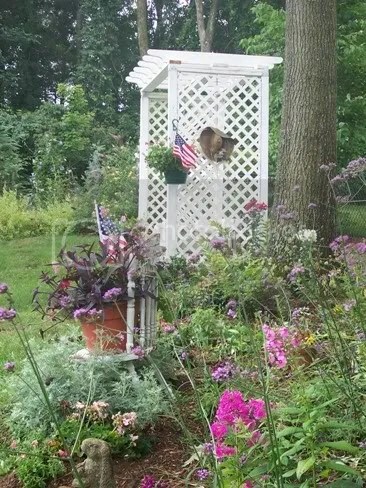 I had a climber on a trellis at my former home and it broke the trellis during high winds. I guess they are just loads of maintenance when located where people are going to walk. Doesn’t mean I won’t grow another one….they are so pretty! Who me? I don’t make mistakes. I think it would be better to label them catastrophies sometimes! Ha ha. At least it’s comforting to know I’m not the only one who messes things up, sometimes I feel like a complete amateur. I’ve decided to go thornless. That’s correct, I have already planted a Lady Banks by a tree in the back 40. It can grow all it wants and decorate the tree top with yellow faces. It is thornless so no worries no matter who touches it. Those Don Juan roses are beautiful but violent. I can’t tell you how many times I was scratched and stabbed by them while pruning at the nursery. And a rose prick hurts for a very long time. MrD was taking out some rose bushes for me once upon a time and it got him in the face. It turned in to a really bad sore that required antibiotics. So they can ber dangerous too. Beautiful mistakes, indeed! We don’t attempt containers at the house because we’re gone all week! The first time my sister came to visit she said we should get some chickens to populate our chicken coop. B said “We’re only here on the weekends!” And my sister said, “Well, how often do chickens need to be fed anyway?” We had a good laugh about that. She was so embarrassed. I love a healthy hanging pot, but one is just not in the cards for us right now! No, don’t get anything that won’t tend itself for a week. Chickens or Pineapple sage won’t do. Both need a lot of attention as you are so smart to know that. It is funny that some folks think a chicken can fend for itself. I would not know the first thing about raising a chicken. And unlike a plant, you can’t kill a few in the process of learning how to keep them alive. I’m with Philip ~ beautiful mistakes 🙂 I’m done with Pineapple Sage … mine looked like it was hit with an ugly stick this year. I’m not sure I’ll get another the more I think about it. I was uploading all my old pics from the worn out computer of yester year. I ran across that big old sage growing in my vege garden. I think something else would be more productive in that spot. Something I don’t have to attach to a watering hose. It’s too bad, that is one beautiful rose. Too bad it didn’t cooperate. I have a hard time giving in when I have made a gardening mistake. That planter looks so healthy! Someone once ask me how I became such a good gardener. It’s all in learning not to kill them I said. I don’t mind a bit admitting my mistakes. Sometimes that’s a whole lot more fun than the flowery version. I’m glad to see you posting. You must be a little on the mend and so glad to see you out and about. i’ll head over and see if you are surviving the snow. Maybe you will have a sunnier summer in 09! Evidently my pineapple sage that did nothing was suffering from lack of water. Thanks. And they need lots of good composted soil to soak up water and nutrients. The do better in our hot area with afternoon shade as well. I would say beautiful mistakes. Part of the real fun of gardening is seeing what works and what doesn’t (rather like my cooking lol) and honest of you to post them and why. That way we all learn and can make choices. Those Proven Winners sure live up to their name. I like Monrovia, Terra Nova, and a few others. I plant the old and the new together. I know more about the new cultivars than the old fashioned but I’m gaining on my lack of knowledge. I prefer some old…like the coneflowers over the new cultivated varieties. Some things you can’t improve upon. Those supertunias by PW are hungry thirsty little guys and gals. They will look awful and quit blooming if you forget to fertilize or water. Don’t go on vacation without someone to tend them while you are gone. I know that you know that…I’m just speaking outloud so everyone will know. I’ve eaten all my cooking mistakes;) I bet you have too. We’re going out for Mexican tonight. Our favorite place with the best salsa in the world. I’ll be back soon with bad breath. It was a lot of fun reading about your Christmas gift and how your husband kept adding to the gift. I thought that story was precious. And your cottage gardening site was a treat to visit as well. I left a response comment about the tadpoles on your blog just now. So awesome that you lived in our area once. But now you live in PA and that is a grand state. I went to PA and saw those rolling hill sides a couple of summers ago. I went to the Boyds Bear shop and man was that awesome. Gettysburg is one of my all time favorite places to visit. I want to take that ghost tour. Funny about the pineapple sage! I have that yellow one too, or rather had – think it’s dead for sure after our frosts/snow/winter craziness here. My mom has some that is easily 5+ ft. tall in the summer. Nutty! It is pretty but thristy. A lady I know, won the local fair 1st prize with one. Ouch! those pyracantha thorns are brutal. You probably remember that one that went up the other side of my former home’s railing. I would train it in the spring and summer when the stems and thorns were a bit more tender. Forget it when they get woody. Thank you for remembering my potting recipe. I have tweaked it a bit to help those hungry cultivars. I’ll put it on my sidebar again when I figure out exactly how I’m going to mix it this year. I ran across a new soil that is made by a family here in the foothills of NC. I will most likely use it as my base. I experimented with leaf mulch last year and that was a disaster. It was too heavy and too wet. I’ll post the new recipe soon and let you know. I have done the same things in the past, esp. the root bound plants thing. I don’t know why I do those things either. Herbs are the worst. I still like growing them as they smell so good. I put some thyme by the door so everyone rubs up against it as they come in and out. I’ve had rosemary get so root bound that I can’t even save the pot. You can’t get it out. Thanks for stopping by my blog!! I also love the Verbena. It does reseed, but I just love how it pokes out above my Iceberg rose so I let it go!! I like it for that very reason too. It is very strong and can help to hold up other top heavy perennials. They last a long time as well. Grow fast too. 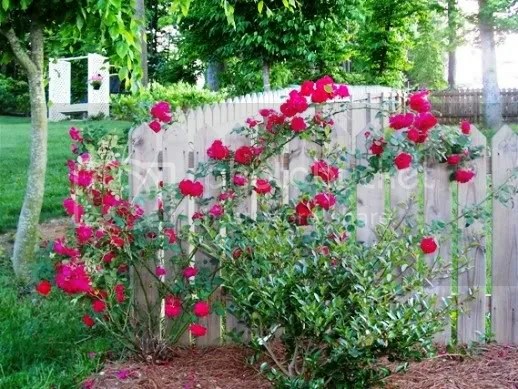 It does have the prettiest roses on it.You are right on an old rail fence it would be beautiful. Now I know I need to fertilize my petunias more. Thank you! You have such pretty flower venues. Thank you a bunch. There are several types of petunias out there. The cultivars that I grow need quite a bit of fertilizer weekly. I use about half strength every Friday with that day’s watering. 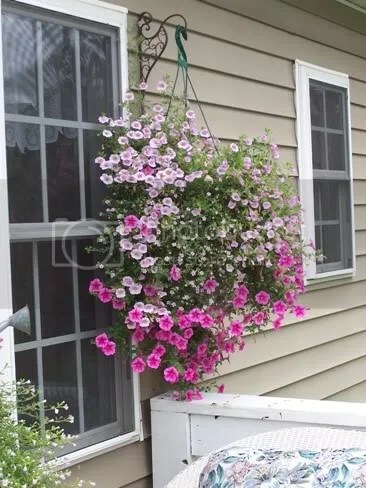 But the petunias that last only a couple of months==say April through July, do best with a 4 month release fertilizer and heavy dead heading. They can sometimes repeat bloom if you cut them back when they get leggy. All the petunias by Proven Winners require no dead heading and will bloom till frost. They are more expensive like usually $4 to $5 a 5″ pot but they last twice as long. They don’t come in six packs.